We live in godless times. I don’t mean the mess the BBC made of the sublime Blandings stories, although I am sure that this too can be put into the balance with all the other evidence. No – I mean our refusal to concede that life is, at heart, a rather serious matter, and that gravitas, or even reverence, is not necessarily indicative either of pomposity or of pretentiousness. And even if it were, even the pompous and the pretentious may be right: failings of character are not, after all, refutations of points of view. On my Facebook page recently, I have had posted two items from Decca, the once respected classical label that boasts in its back catalogue, amongst other riches, recordings of Benjamin Britten performing his own works, and the first studio recording of Wagner’s Ring Cycle. But the album they were advertising on my Facebook page was called “Sleep”. “Want to get a great night’s sleep?” the posting asked. “Here are some great classical tracks to help you unwind, relax, and prepare for bedtime…” Well, one gets used to the constant trivialisation of that which is precious; one even learns not to mind too much: it’s only Facebook, after all. Facebook is a good way of keeping in touch with people one might otherwise lose touch with, but it’s foolish taking it too seriously. So I let it go. But today, those awfully nice marketing people at Decca were back with this: “Are you finding the frantic pace of modern life getting you down? Take a break with 101 of the greatest pieces of music ever written.” And in between these two, another unsolicited post on Facebook informed me “’Liking’ Mozart on Facebook makes you clever”. Well, I never! And the music of Mozart should, apparently, be played to babies: people actually take music of this stature, and, instead of listening to it, play it to their babies because some idiot somewhere reckons it will make the babies more intelligent? What is the matter with people? Yes, yes, I know, it’s all commerce, it all advertising-speak. Mustn’t take it seriously, and all that. But advertisers would not promote this sort of piss-a-bed gibberish were there not a large section of the public prepared to respond to it. And no matter how hard I try not to take this seriously, it is hard not to be irked when centuries of so profound and so enriching a musical tradition are reduced merely to sounds to fall asleep to. Must everything be reduced thus? Can we not accept an essential seriousness in anything? The Hell where nothing really matters very much: it is a sort of Hell that even Dante had not envisaged in his survey of the various types of damnation that humans engineer for themselves. Shakespeare, though, knew of this Hell: this is the Hell into which Macbeth damns himself. Not that she dwells in any kind of joy, doubtful or otherwise. She is crushed by a burden of guilt so terrible, that her mind soon buckles under the strain. Even sleep brings no respite, as she re-lives, over and over and over again, that fatal night when she lost her soul for ever. Whether he kills more or whether he kills no more, it’s all the same, it’s all equally tedious. Life itself is merely “a tale told by an idiot”: it’s all mere sound and fury, and it signifies nothing. Trying to avoid the Hell of Guilt to which his wife is damned, Macbeth backs instead into a rather different but equally potent Hell – the Hell of Tedium. Of course, one cannot miss what one does not acknowledge. But there is a part of Macbeth’s soul that does acknowledge, that does understand what it is that he has lost: he has lost all sense of seriousness. All that matters most, all that is most serious, “honour, love, obedience, troops of friends,” he cannot hope to have. And that is his tragedy. Not his death, but the meaningless, trivial rigmarole his life has become. Well, at least Macbeth had his reasons for forcing himself to believe that all is but toys. But what possible reason can the rest of us have, I wonder? What excuse can we have for reducing the music of Mozart or of Debussy to the level of aural valium? How can we justify the insistence that even Tolstoy’s War and Peace is but a soap opera? The Hell of Triviality is, rather paradoxically, as serious a form of damnation as any other. If you’re within reasonable distance of Egham in Surrey, and don’t have anything in particular to do this Saturday evening (March 16th), why not pop over to the Egham Free Church, on Egham High Street, for a piano recital by Lara Melda? Ms Melda was the winner of the prestigious 2010 BBC Young Musician of the Year competition. And here she is, playing the slow movement of Rachmaninoff’s 2nd piano concerto. So why am I advertising this concert on my blog? Simple. I happen to be the current chairman of the Egham and District Music Club, which is organizing this concert. That’s all very well, Mr Pope, but have you any idea just how much there is to learn? There’s nothing like walking into a well-stocked bookshop to make one feel inadequate. Everything from Byzantine architecture to microbiology, from macro-economic theory to Icelandic sagas, from theories of linguistics to statistical analysis … well, statistical analysis I do happen to know a bit about: that’s my job after all. But on just about everything else, I am so ignorant that it really is quite embarrassing. It isn’t just a single Pierian spring, it’s many – and there just aren’t enough years in a lifetime to drink deeply out of all these Pierian springs. Dammit, there isn’t even enough time to take a sip from each. So, against Mr Pope’s excellent advice, I am trying to learn a bit, just a bit, about philosophy. Nothing particularly deep as such: I don’t have that lifetime to spend on it that is required for a deep understanding. But a smattering, at least, so I don’t feel a complete idiot. So next time I come across a mention of Kant’s categorical imperative or whatever, I’ll have at least something of an idea what it means. 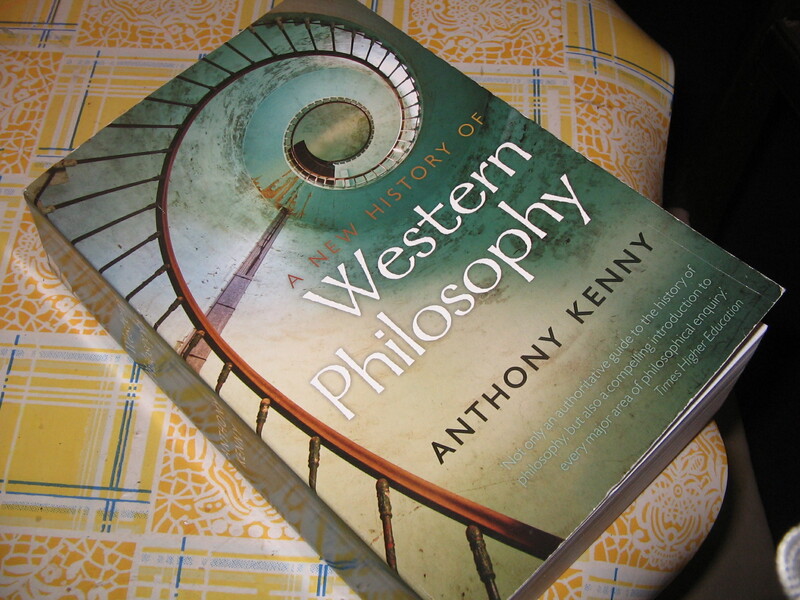 So I started recently Sir Anthony Kenny’s A New History of Western Philosophy. Although an introduction to the subject for a layman like myself, it runs to over 1000 pages, but it’s in four self-contained parts – which had previously been published separately – making it quite easy to split the reading into four less intimidating chunks. I’ll not attempt a review of this: how can I review a book written by an acknowledged expert on a matter on which I am so very ignorant? I mean, I’m hardly in a position to offer a critique Sir Anthony’s interpretation of Aristotelian epistemology, am I? I’m lucky if I know what “epistemology” means, if it comes to that! But I can, at least, report that the very clear, precise and elegant prose is a delight to read. It does, admittedly, exercise the old intellect a bit, but that’s only to be expected given the subject; and given, further, that the author refuses to patronise the reader. The four parts of the book are: “Ancient Philosophy”, “Medieval Philosophy”, “The Rise of Modern Philosophy”, and “Philosophy in the Modern World”. In each, we are presented with sketches of some of the major philosophers of that era, and of their contributions; and then, chapters dealing with specific themes – e.g. “logic and language”, “physics”, “metaphysics”, and so on. The last chapter of each of the four parts is called “God”, and deals – presumably – with ideas about the divine. I am nearly at the end of the first of these four parts, and the journey so far, though challenging to a novice such as myself, has proved fascinating and enlightening. Rarely have I come across so lucid and so elegantly expressed an exposition of ideas of such complexity. Of course, it is a question of what one is used to: I am not used to reading on this topic. When I came to the chapter on logic, I found it initially difficult to follow the necessarily precise wording of the various arguments; but after a while, I hit upon the expedient of translating what I was reading into mathematical terminology, and then, everything fell naturally into place. This shouldn’t perhaps be too surprising given my own academic background, but I hadn’t realised till now how much better I understand certain things in the language of mathematics than in even the clearest of English. But where the argument cannot be translated into mathematical terms, I do, I confess, find myself struggling to absorb the arguments, or even the concepts. I can’t remember when was the last time I read a book quite so slowly as this. I should stress, though that the difficulties I am encountering are the difficulties inherent in the subject, and in no way a reflection on the quality of the writing. I’ll give this book a rest after finishing the first part, and move on to a few other things before returning to the next part – “Medieval Philosophy”. But return to this I certainly shall. Although I am in no position to offer a review of it, I can wholeheartedly recommend it to anyone who, like me, needs an introduction to the subject, but who does not like the idea of being patronised. Anthony Kenny’s writing is a model of lucidity, and an object lesson in how even the most abstruse of ideas can be expressed clearly, with charm and with elegance.